April 4 is National Cordon Bleu Day. Although you can think that this dish was developed in Le Cordon Bleu, the world's largest school for hospitality education based in France, it has nothing to do with that. 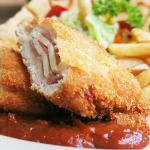 Chicken Cordon Bleu is a relatively recent American creation that was mentioned for the first time in 1967. However similar recipes can be found dating back to 1955, but they included veal. Today everyone knows Cordon Bleu as a breaded cutlet pounded thin and wrapped around a slice of ham and a slice of cheese, breaded and then pan fried or baked. Chicken is the most common meat for Cordon Bleu, although sometimes veal and even pork is used. The name of the dish “Cordon Bleu” has got French roots. The knights used blue ribbons (that is how “cordon bleu” is translated from French) to hang their talismans. This eventually became tightly associated with distinction and honor. Even today we use blue ribbons as awards for excellence. Don't you think that Cordon Bleu deserves a blue ribbon?